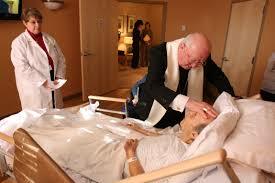 There is probably no sacrament more misunderstood than the Sacrament of Anointing of the Sick. And it likely goes back to the time when it was called Extreme Unction—the Last Anointing. In their attempt to revitalise all seven sacraments, the bishops of Vatican II not only looked at the way each sacrament was celebrated, but the theology behind each celebration. In the case of the Sacrament of Anointing of the Sick, they renewed the theology, gave it a new name, and revised the ritual. Moments of mental or physical illness can be times of crisis. They can mean a time of loss and pain, a time of insight and growth, or anything in between (cf.CCC1501). Regardless, our loving God wants to be a part of our experience. He wants to share our lives with us, the bad and the good (cf.CCC1503). But his presence and support often comes in and through the Church—our faith community. The kind words and help that we receive from others are a part of this, for God works through human means. We need to pay attention to how God works through them. The Church can officially support us through the sacraments. In the case of an illness, that support comes in the form of the Sacrament of Anointing of the Sick (cf.CCC1511). And, as the ritual clearly states, the focus is life, health, and well-being. But we must remember that a part of the fullness of life is our spiritual lives with God, which begun at Baptism and will inevitably lead to death and resurrection (cf.CCC1523). Clearly recognizing that human frailty is a part of the reality of life, our loving God is with us through this sacrament to strengthen us when our minds or bodies grow weak. Thus, a person facing a significant surgery is encouraged to avail themselves of this sacrament (cf.CCC1515), as well as the aged or seriously ill (cf.CCC1513). The bishops at Vatican II were realistic in recognising human illness and frailty. If death should be the result of the illness, God and his Church assist the journey into new life by offering the Eucharist as Viaticum. Just as the Eucharist nourished us throughout life, so it is nourishment for our travels into new life. This sacrament, then, is not to be viewed as the kiss of death, but one of healing and life. In the Anointing of the Sick, the focus is on the possibility of a spiritual and/or a physical healing. The prayers address the sick person as a whole, which includes all aspects of our human life. So while a physical or psychological ailment may be the most obvious cause of the person’s suffering, other aspects of the person’s health are also taken into consideration. Many times, the spiritual healing is far more dramatic than the physical, and sometimes this takes the form of an increased ability to accept the physical illness and its suffering. Death is a reality of our human life, and we need not try to deny that fact when it becomes obvious or inevitable. In such cases, the Sacrament of Anointing prepares a person for death, which includes spiritual healing and the forgiveness of sins. Canon law states that anyone who is in some danger of death from an illness or from old age can receive the Sacrament of the Anointing of the Sick. Likewise, should the person’s condition worsen, the sacrament may be repeated (cf.CIC, can. 1004). The code then immediately offers this caveat: If there is any doubt as to the seriousness of the illness or condition, the sacrament is to be received (cf.CIC, can. 1005). The Catechism of the Catholic Church adds that it is also appropriate to receive the sacrament prior to surgery (cf.CCC, 1515). It must also be remembered that the sacrament is a sacrament of the living. It cannot be offered to one who has already breathed their last breath. But it is appropriate for those near death as it completes our life on earth just as baptism began it (cf.CCC, 1523). How do I arrange for Annotation of the Sick? If you, or a member of your family, would like to receive the sacrament of the Anointing of the Sick, please contact Fr Mathew in person, by telephone, by email or by using the contact form on this site. The method of contact should be commensurate with the urgency of the situation.